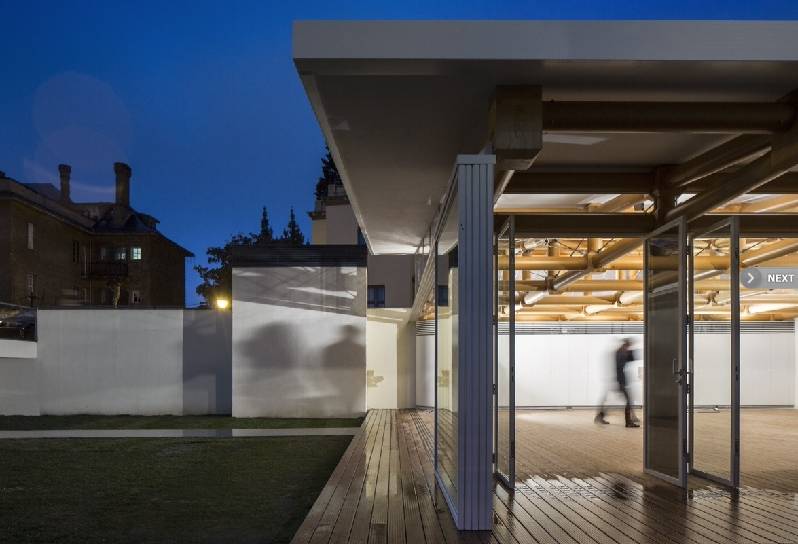 On Wednesday March 20th Japanese architect Shigeru Ban was at IE Business School in Madrid for the official opening of his latest construction, a temporary pavilion made of 173 paper tubes. 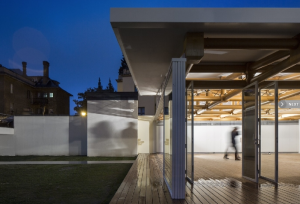 The Pavilion is located in the grounds of IE’s Madrid campus and will be used to host executive education events and other activities. Ban has gained increasing recognition over the last two decades for his architectonic projects, not only because of his innovative use of materials but also for his commitment to humanitarian aid initiatives. Other participants in the event included Santiago Iñiguez, Dean of IE Business School and President of IE University, Fernando Serrano-Súñer, the Spanish architect who headed the construction, Martha Thorne, Vice Dean for External Relations at IE School of Architecture, and Jaime de Jaraíz, Vice President of LG España. The structural design is eminently efficient. It took only two weeks to build, is based on sustainability objectives, and there was a requirement that it be a temporary construction. It is made of 173 paper tubes held together by timber joints that rest on paper columns. “One of the main challenges in any project is that the design must take into consideration the specific characteristics of the location. In this case, we used an existing wall and kept the pavilion as far as possible from the adjacent building”, said architect Shigeru Ban. “I try to use local firms for my work. In this case the tubes, for example, were made in Zaragoza”. Shigeru Ban also pointed out that students from IE School of Architecture took part in assembling the paper tubes, and underscored how important it was as an educational experience for them. The form of the pavilion, built by workers from the region using local materials, is an excellent example of design and construction for IE University’s architecture students. The construction will be used for diverse IE activities, including meetings, presentations and receptions. Shigeru Ban’s most famous projects include the Pompidou – Metz Center, Metz, France (2009); the Metal Shutter House, New York, (2009); Takatori Church, Kobe, Japan (2007); and the Japanese Pavilion at Hannover World Exhibition Expo 2000. Shigeru Ban was Time Magazine’s Innovator of the Year in 2001. LG has equipped the pavilion with its Multi V III heating and air conditioning systems, which will ensure a supply of “good air” and a healthy environment. The Multi V III systems installed by LG at IE provide three key advantages: greater energy-saving potential, which in turn permits lower levels of energy consumption; greater flexibility in terms of installation, which means that it can be adapted to any environment; and an extremely low noise level. In addition to these advantages it also provides the best guarantee in the market.